Creating custom attribute is pretty simple really, just follow the example. You need to return MvcHtmlString – that is string with your html to be displayed on a page – this will not be escaped. Have a base controller that is inherited by all your controllers. That is always a good idea – you can easily add things that work site-wide. In you base controller have a OnActionExecuting overriden – here we are going to store the previous page. && filterContext.IsChildAction == false)    // do no overwrite if we do child action. // stop overwriting previous page if we just reload the current page. Then you can reference Session[“PrevUrl”] in controllers, but there is a better way of doing it – create attribute! /// and when you do submit of form, this functionality will kick in. /// to whatever it says. /// If no Session variable is set, just do what it is supposed to do in the first place. Ninject is very cool and lightweight DI container. But you can not always inject objects through constructor – sometimes you must have parameter-less constructor, like in MvcApplication object. 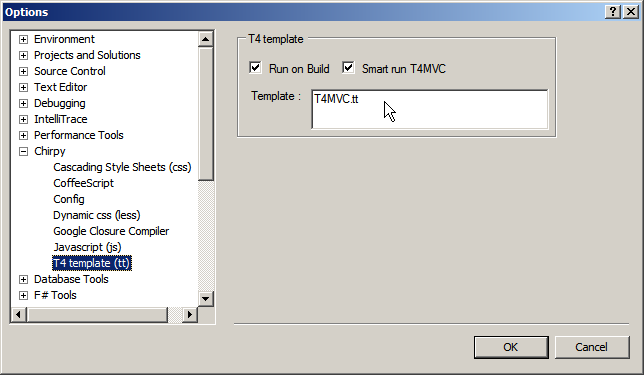 In Razor compiler directives do not work, cause Razor Views are not compiled. Everybody is talking how good the T4 templates, but nobody tells you how to generates the bloody things. TextTransformation.TransformAllTemplates – that should do the trick. If you would like a button for that – add Build Toolbar Panel and it should contain “Transform All Templates” button.